We are going to kick off the first workweek of 2016 with two big stories for East San Jose. Today, we'll talk about the first major development proposal in decades for East San Jose. Tomorrow, we'll have an in depth restaurant review for what might just be the best new restaurant in all of San Jose--and it happens to be in East San Jose. 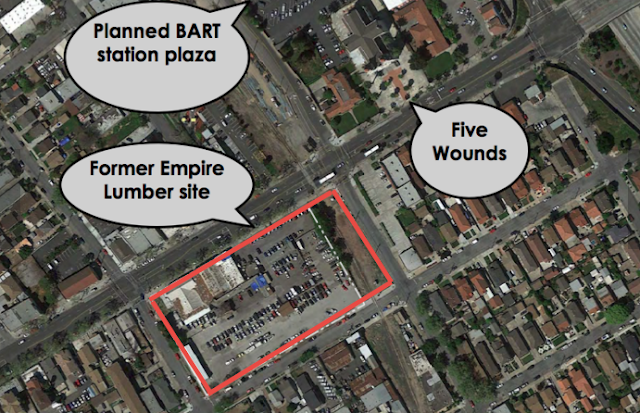 The Empire Lumber site at 1260 E. Santa Clara Street is clearly a prime spot for redevelopment given that it is across the street from a future BART station. Despite the fact that we won't see any trains stopping at that station until the year 2025 or so, developers have already started taking serious interest in the neighborhood. Steinberg has proposed a seven-story mixed-use building with 418 apartments and 30,000 SQFT of commercial space on the ground floor. 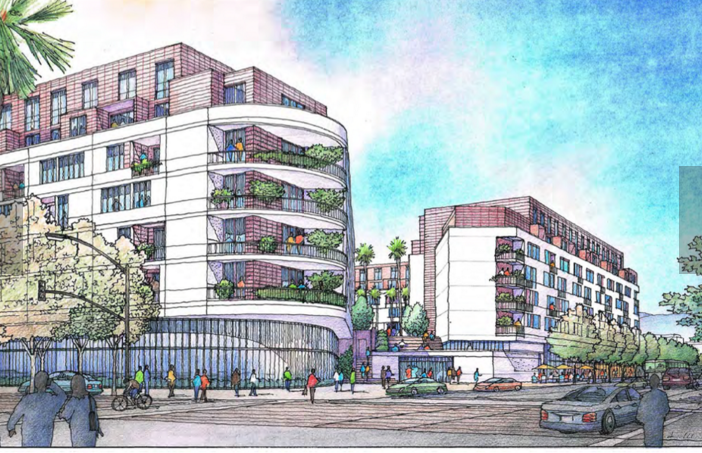 As you can see from the drawings below, this is not your typical building in East San Jose. You have large sidewalks with outdoor dining along Santa Clara Street facing Five Wounds Portuguese National Church--one of our most iconic buildings. There are plenty of large balconies for residents, including some nice ones on the penthouse floors. There is a swimming pool and green space on the podium level above the retail and parking, and Steinberg even designed it to have a view. 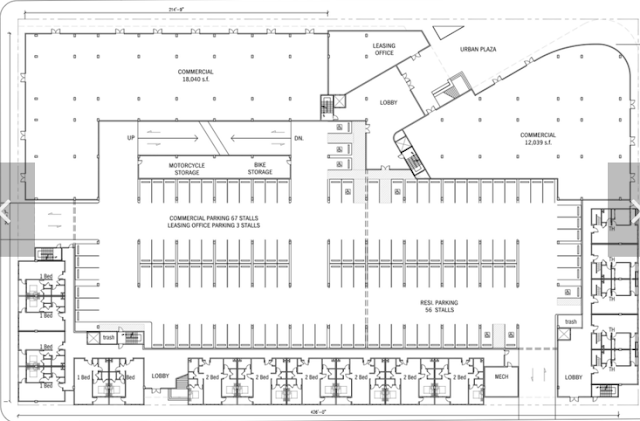 A publicly accessible urban plaza would sit between two large retail pads: 18,000 SQFT on East Santa Clara Street and 12,000 SQFT at the corner of Santa Clara and 28th Street. The Empire Lumber lot currently houses a used-car dealership, definitely not the best use for this land. There is some push-back from the community on the proposed height of 85 feet. The current site plan has a cap of 55 feet on part of the proposal, so Steinberg would require a variance to get approval. Given this location near a future BART station and a Bus Rapid Transit (BRT) station that will hopefully go live by the end of this year, we should be going as dense and tall as possible. This would be a terrific addition to the neighborhood! Beautiful!!! See? Developments CAN make use of CA weather by including terraces–big and/or small– for every unit. Downtown developers should take note. S.
According to the picture, it looks to me that, in addition to wanting a height exception, they are planning to encroach on the Five Wounds trail by annexing the railroad right of way, which is currently VTA property. With no existing mass transit in that area, it sounds to me like this may have a major negative impact on the local community. Show me the traffic studies -- I am not a believer. VTA Bus Rapid Transit will be live and servicing the area well before this gets built. BART will come later, making this one of the best connected areas for transit in San Jose (circa 2025). Business owners in the area will have more residents as potential customers and current residents will have new retail and restaurants in walking distance. It should be a win-win. The additional traffic will be negligible if the Bus Rapid Transit system does its job. This proposed development is located in the area addressed in the Roosevelt Park Urban Village Plan. The first four urban village plans adopted by the city in November 2013 were spawned from the Five Wounds/Brookwood Terrace BART Station Area Community Concept Plan. This 210-page plan was the result of a decade-long planning process launched by the Five Wounds/Brookwood Terrace Neighborhood Action Coalition (FWBT NAC) in 2000. That’s when we were told that a BART station would be coming to our neighborhood. Instead of a NIMBY attitude, we adopted a YIMBY (Yes In My Back Yard) attitude, and we would help develop the plan for our neighborhood around the BART station. VTA had initially envisioned a BART station with a 17-acre surface paved parking lot on top. That was a non-starter with our neighborhood, and the main catalyst behind our own urban planning efforts. Our FWBT NAC began our urban planning efforts in our Strong Neighborhoods Initiative Neighborhood Improvement Plan. In 2007-2008, we took the unprecedented step of conducting a series of public meetings attended by hundreds of community members and facilitated by the nascent CommUniverCity that resulted in the community’s vision documented in our Community Concept Plan completed in 2010. The Envision 2040 Task Force that was convened during that timeframe was discussing a new concept to San José called “urban villages”. Task Force members were discussing the potential for 70 such villages over the ensuing 30 years. So in 2011, the FWBT NAC proposed to the Envision 2040 Task Force that our Community Concept Plan embodied their concept of an urban village and that our plan should be considered for incorporation into the city’s General Plan. We went so far as to publish an op-ed in the Mercury: It takes a village to plan a village: City should respect Five Wounds project. The Envision 2040 Task Force directed planning staff to engage our FWBT NAC to transform our 210-page plan into four smaller village plans that could be considered by the City Council for incorporation into the General Plan. With a grant from the Health Trust’s Healthy Cities/Healthy Communities Initiative, we worked side-by-side with city planning staff to create the city’s first four urban village plans from our Community Concept Plan. In 2013, before our four plans came before the City Council, the Mercury published an editorial of their own: San Jose Urban Village rules needed. 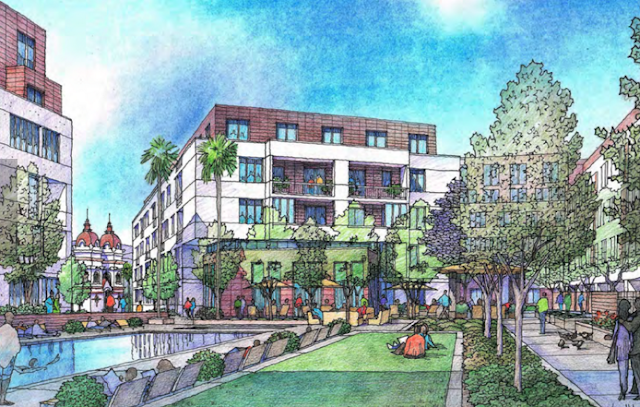 In November 2013, our four urban village plans were unanimously approved by the City Council. The Roosevelt Park Urban Village Plan addresses the East Santa Clara Street corridor from Coyote Creek to Hwy 101. The Five Wounds Urban Village Plan addresses the future BART station area behind Five Wounds Portuguese National Church north to the KXRX towers and west to N. 27th Street. The 24th and William Street Urban Village Plan addresses the blocks adjacent to the abandoned UPRR tracks (now VTA’s) south of Shortridge Avenue to the area around 24th and William Streets. The Little Portugal Urban Village Plan addresses the Alum Rock Avenue corridor from Hwy 101 to King Road. A key consideration in the Roosevelt Park Urban Village Plan is the community’s requirement to maintain the prominence of Five Wounds Portuguese National Church in the cityscape. The Cathedral Basilica of St. Joseph downtown has been diminished by the buildings that grew up around it. Development surrounding Five Wounds Church can be architected in such a way that the church’s prominence is neither diminished in height nor in mass. Then there is the issue of halving the FAR ratio on the proposed site. 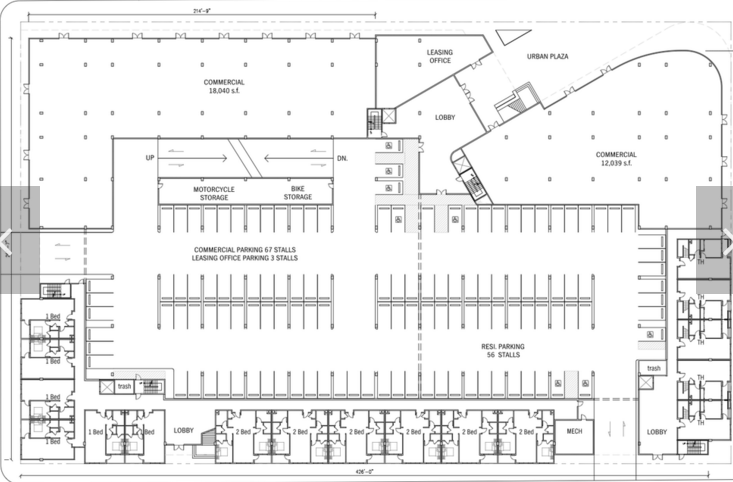 FAR ratios translate into floor areas designated for job creation. As we have become painfully aware, San José is a jobs-light city, so any change to the General Plan that cuts the potential for job creation also cuts the potential for tax revenue for essential services. Our urban village plans were predicated on the arrival of BART, but that’s not a given. BART Phase II is facing a severe financial shortfall to the tune of $2.4 billion. It is anticipated that about half of that would have to come from local coffers. November’s sales tax ballot measure will alone decide whether BART will arrive in the Five Wounds neighborhood around 2025. As for Bus Rapid Transit (BRT), there were originally supposed to be eastbound and westbound stations at 28th and East Santa Clara Street to interface with BART. VTA has since moved those stations; they’re currently under construction between 23rd and 24th Streets. So as you can see, there are several balls being juggled right now in the Five Wounds/Brookwood Terrace Neighborhood. That’s a good thing. But the conversation has just begun. Why did VTA decide to get rid of the BART to Bus Rapid Transit connection? Will there be an opportunity to construct a bus stop at the BART station? That's a really good question about why VTA moved the BRT station from 28th Street, one that we've asked. With no satisfactory answer. But back in September 2014, VTA said they were planning to move the BART station from behind Five Wounds Church to under East Santa Clara Street near 23rd Street. The community challenged that decision on several television news programs, radio, and print media, and in about ten days, VTA returned the BART station to behind the church. And they never answered "why" in that instance. Nothing, nada. We could only guess that they decided to move the BRT station to near 23rd Street to interface with the moved BART station, and that they knew that they would be doing so years before September 2014. Now asked about interfacing BRT with the potential BART station behind the church, VTA responds that they will demolish the stations near 23rd Street and construct new ones at 28th Street. Doing the math for a system that's costing about $110 million for 11 stations between Diridon and Eastridge, that comes to $10 million wasted on moving a station back to where it was originally supposed to be built at 28th Street.